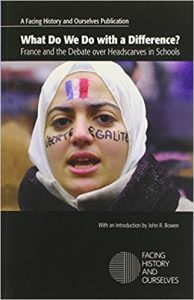 This Facing History and Ourselves publication focuses on the debate over headscarves in French schools as an opening to discuss the civic dilemmas that often arise during periods of mass migration. Religion and secularism in public schools. Immigration and assimilation. Gender and ethnicity. Participation in democracy and public debate. Rapid social change and cherished cultural traditions. Personal, collective, and national identities. Using a unique mix of scholarly insights, first-person stories, interviews with school-age students, plus multimedia resources and examples from popular culture, What Do We Do with a Difference? uses that national debate as a way to develop an educational framework for integration, tolerance, and cultural acceptance.